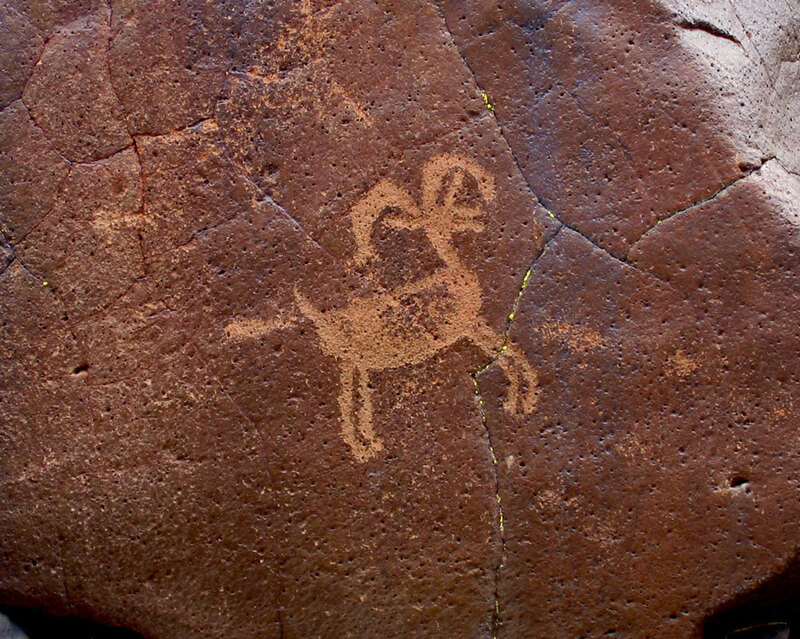 The Coso Mountain petroglyphs are the last remnant of a society that started thousands of years ago and lived almost to our present time. And through the artistry and symbolism of these petroglyphs we know that it was a hunter gather society that was based on hunting desert bighorn sheep, and so the desert bighorn sheep loom large in its everyday culture and mythology just as the buffalo hunting societies that once lived on the Great Plains centered their culture and mythology on the buffalo. And while the rocks and bighorn sheep have changed little, the climate and the people have changed considerably; for one, the climate was wetter back then as the dry lakes that are scattered throughout the desert show, and this, in combination with other factors, allowed the bighorn sheep to become the dominant grazing animal of that time. As for the people, we no longer live in hunter-gatherer societies that depend on hunting bighorn sheep for survival, and indeed, there are very few people in our modern society who know anything about bighorn sheep. Perhaps the last person to hunt bighorn sheep in the traditional manner was an Indian name Shoshone John who was written about in a book entitled Burl Bill and Me, which is an incredible book about the desert that I highly recommend. Shoshone John would be hunting bighorn sheep in the Panamint Range in the 1930s and 40s and, while it was said he owned a rifle, he used a bow made out of juniper wood and arrowheads made from greasewood to hunt sheep. I can only imagine that he used greasewood arrowheads because he did not know how to work stone as this skill was probably not passed on to him; however, I would be very interested to know if using greasewood arrowheads was an innovation on his part or part of the traditional hunting knowledge of this area. Perhaps it was a material that ancient people used when they didn't have the proper stone and were out on the hunt. As anybody who has traveled the desert much in a 4x4 knows, the greasewood is incredibly strong and can puncture tires with ease . I would have really liked to talk to Shoshone John as I'm sure in the Coso petroglyphs he would've seen things that only a person with insider knowledge would know. Without a doubt he was a closest thing to a Rosetta Stone we ever had; however, he and the last of his kind are now gone and there are things about these petroglyphs we will never know. However, that is not to say that these petroglyphs are mute or meaningless; there is still much that they speak to and things that we can learn from them because they were written in the environment and with the technology of their time. So in them we can see beauty and symbolism produced by the human spirit as it was written then and is interpreted today.